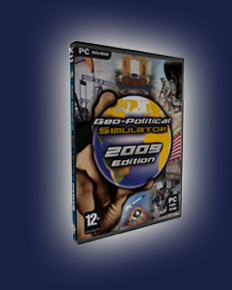 Geo-Political Simulator, aka G.P.S., is an economic and geopolitical simulator game for PC. In G.P.S., the player plays the role of the head of State or government (president, monarch, prime minister …) of a country he has selected at the beginning of the game, and may intervene in all the following fields: the economy, social issues, the military, the Home Office and the Foreign Office, ecology, culture, etc. -“Free mode”: the player's objective is to remain in power as long as possible and to further his influence throughout the world. - “Wargame” mode: several players (up to 16) confront one another online in the course of military campaigns taking place in real time. This mode is also available in solo gaming. This English version includes updated 2009 geopolitical data and 10 new scenarios and missions including "A new President for USA", and "2009, the big recession"